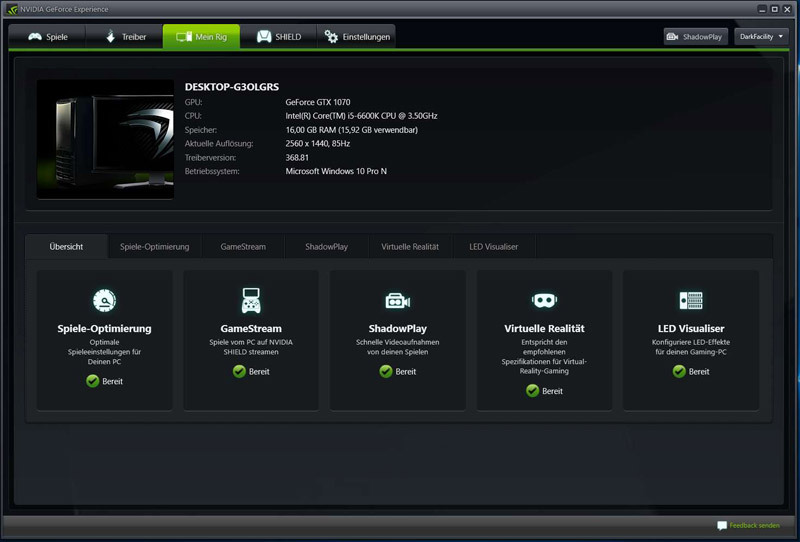 By rolling out the brand new generation, called pascal, nVidia decided to bring up two versions of the graphics card. There is the version called founders edition, which is the legacy reference design and the custom card. Those custom cards are special versions of the founders edition where manufacturers change specific parts, like the cooler or the power supply. With these customs designs manufacturers are trying to get more performance out of the GP104 chip. I want to take a look at a custom model made by Inno3D which is officially called Inno3D iChill GeForce GTX 1070 X3. 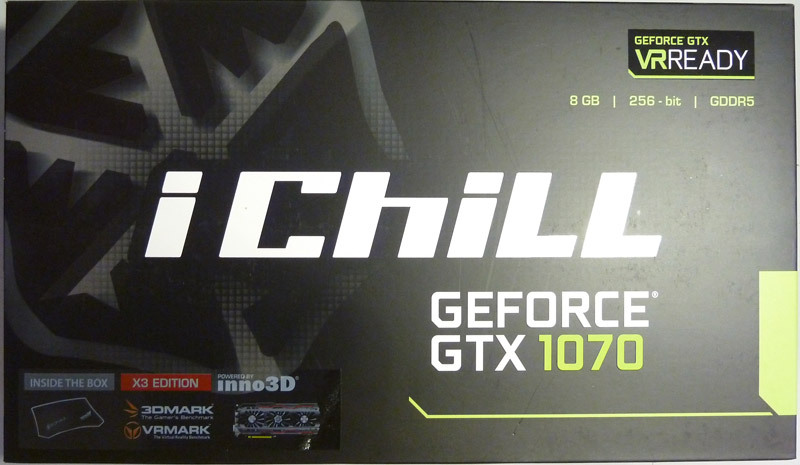 The video card is delivered in an inconspicuous black box with the label iChill GeForce GTX 1070. Interesting fact is, that there is no sign of the manufacturer on the box, you can only see a small powered by Inno3D logo. I think there is nothing to hide in case of Inno3D. So let's check what is in the box! Don't expect too much in the box, so you won't get disappointed. I think for the most users this is definitely enough. Perhaps there could be some adapter for power or the video, but I think most people don't need that anyway. Personally I'm fine with the package. Because I have a custom version of the nVidia GeForce GTX 1070, there are some difference to the founders edition. The card I'm testing is about 30mm longer and a bit wider than the founders edition. Before you buy it, you should check, if the cards fits in your case, because the card itself is very long. With some of the newer cases there should be no problem, because you can detach a drive bay or kind of that, so that the card will fit in there. There is no difference with power-connector in terms of the founders edition and my custom version. The great difference is the power-target. Where there is a power-target of 168 W for the founders edition, the Inno3D iChill X3 has a powertarget of 200 W. Even the core clock and the memory-speed are higher at my custom version. 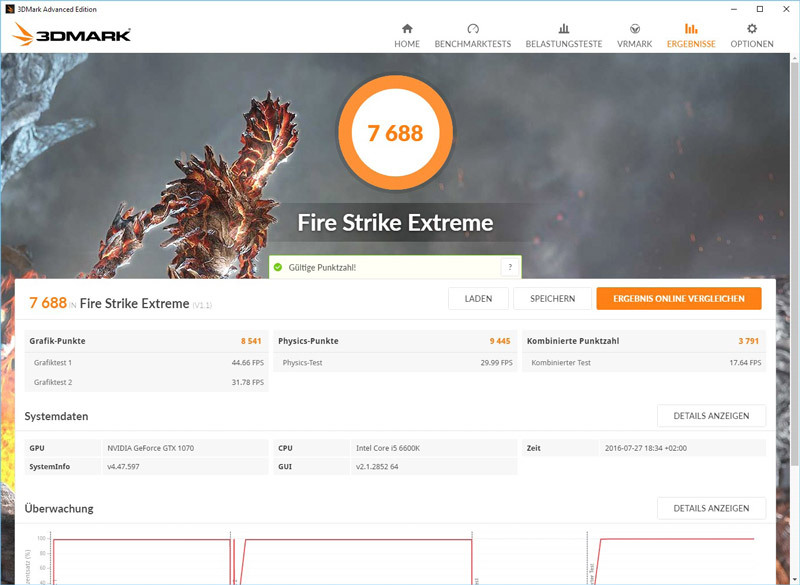 With 1.620 MHz the iChill X3 has a 114 MHz increased core clock, where the boost with 1822 MHz is even 139 MHz higher than the clock of the founders edition. The memory has a clock of 2050 MHz which is 50 MHz than the founders edition. The most obvious difference by far is the large cooling solution by Inno3D. There are 3x 90mm fans to cool the GPU. 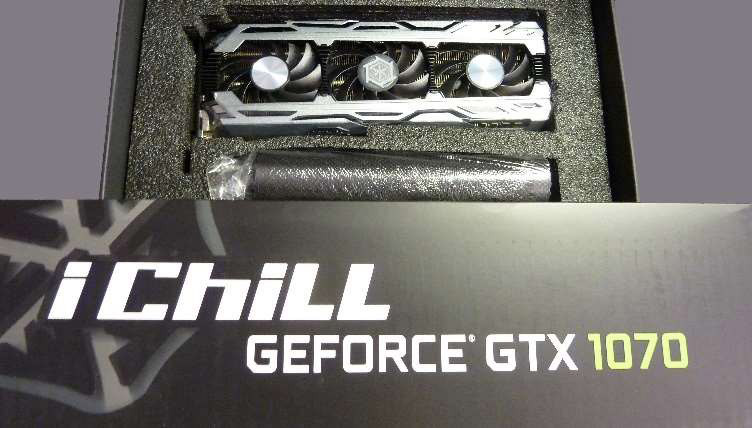 With this large cooler there should be the possibility to run your graphics-card at a zero-fan-mode, where it produces no noise. When you first see the card, you will notice that large silver cooler made by Inno3D. This large cooler covers the hole front. Except for the fan with a snow-flake logo there is nothing special on the front. Here you can see the connections. The only thing to mention, the HDMI connection is between the DisplayPort connectors. On the backside of the card you can see a massive black backplate. You will notice that the card is shorter than the cooler, so that the fans can fit on the cooler. Maybe this time the backplate will prevent the bend of the card, but this I can't test. My last graphics-card, a GeForce GTX 770 bend over time a lot. The next picture will show the card in my computer. I think that the RGB LED fits well into the design. While you can't control the RGB-LED with nVidias control-panel, the colours change automatically with the fan-speed. If the card is cool and the fans don't rotate, the iChill logo is blue. 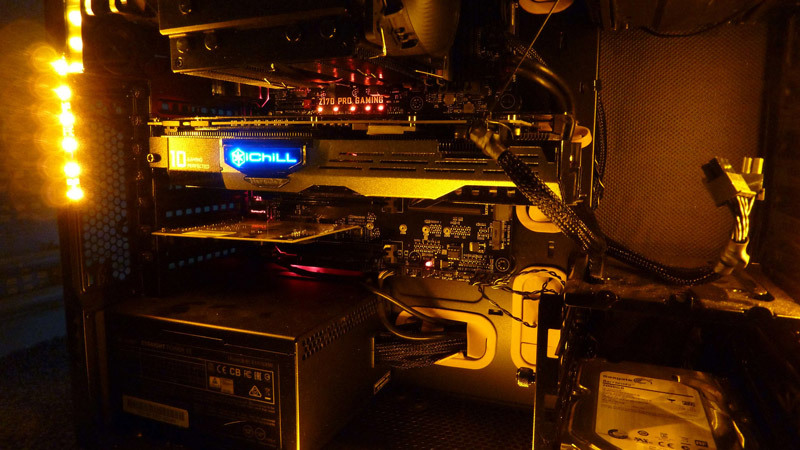 The more the fans have to work, the more the LEDs become red. In my opinion it's a very nice effect. All my tests will run at a resolution 2560 x 1440 pixel (QHD). 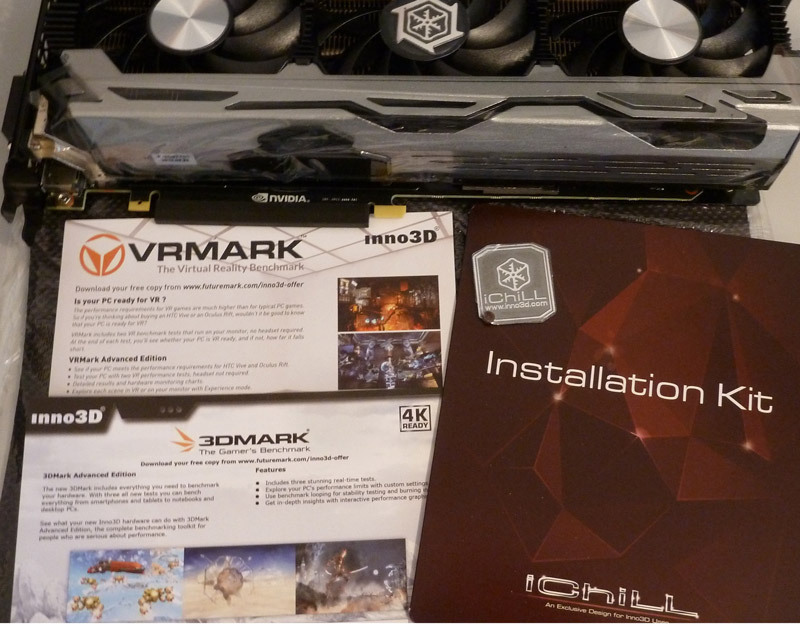 With the code from Inno3D I was able to run the benchmark 3D Mark Advanced Edition. 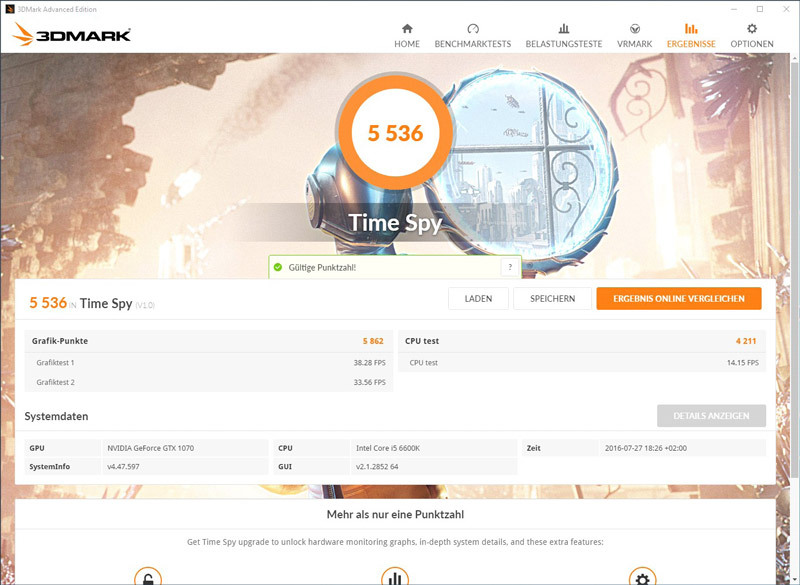 I tested it with the Time Spy demo and a result of 5536 points. With the Fire Strike Extreme demo, the card had 7688 points. 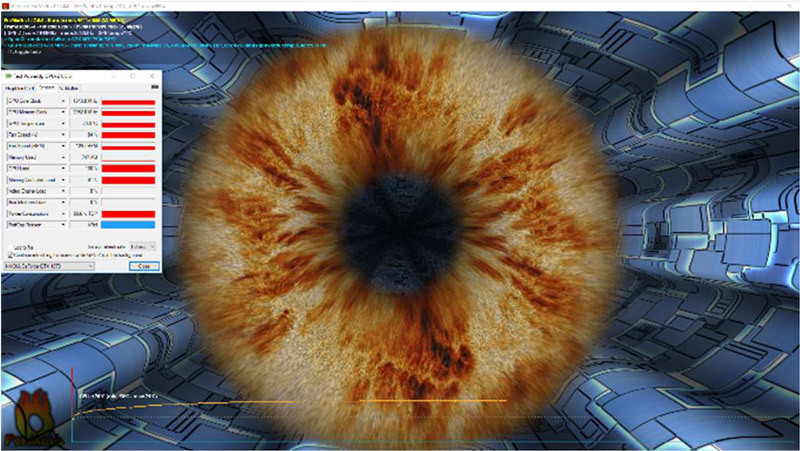 The FurMark benchmark is known to take fully power from the graphics card. After stress testing for about 10 minutes, the temperature rises to about 70°C. While the clock-speed was in the beginning at 1961 MHz it only drops to 1949 MHz at the end of the test, which is very impressive. 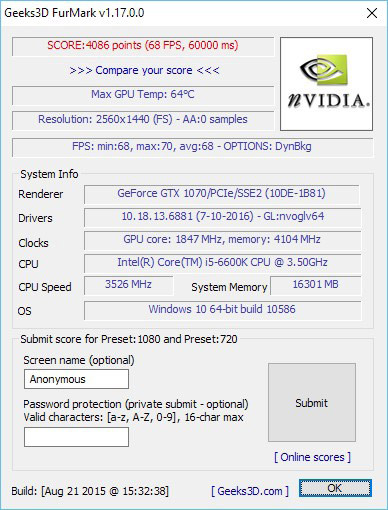 The FurMark benchmark finished with a score of 4086 points at QHD preset. A very popular team strategy shooter by valve. The engine is very simple, so a better GPU doesn't gain too much fps in-game. 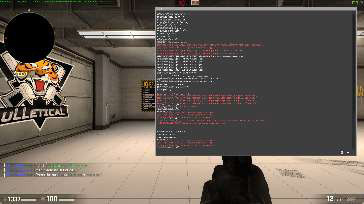 There is community made map where you can benchmark counter strike. I achieved a score of 268.06 fps. In a normal game you will see your fps-counter go easily beyond 400. When you don't think of the price, you will get a great graphics-card with a lot of power, which consume even lesser than my old GTX 770. In my case the graphics card performance is doubled, while the power-consumption is a bit lower, than my old setup. While I was testing the card, there was no point where I heard the fans of the card, even the indicator of the LED got orange. In my opinion there are not many competitors to the GTX 1070. NVidia has a GTX 980 Ti which cost about the same, but has slightly less memory and wants a lot more energy. With the R9 Fury X there is an alternative by ATI, but it has also a lot higher power consumption. I think the Inno3D, especially the iChill X3, is a great card with a fair price. You won't be disappointed. Here you can order the Inno3D iChill GTX 1070 X3 inexpensively.